Learn how he has created custom training programs for golfers and non-golfers alike. Upon leaving the UK for New York City in 2004, Will set off on a career as a personal trainer. After working in gyms on the Upper East Side for many years, Will eventually took the decision to work independently. Focusing mostly on sport specific training, Will came across golf almost by chance. It didn't occur to him that he was residing in a hotbed of golf in the USA- the New York metropolitan area. 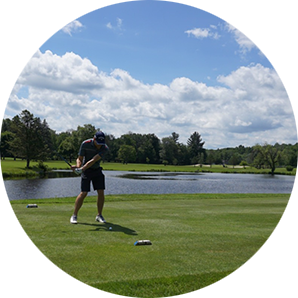 He was invited to play at the Pound Ridge Golf Club in 2011 (one of the hardest public golf courses in the country) and it kicked Will's backside. Having played a few rounds in his youth he was comfortable on the links and that gave him a desire to see how good he could get. After a few months of playing, Will realized just how popular golf is with his clients and an idea was born: Contour a career to combine passions for fitness and golf. Through watching TV's Titleist Performance Institute Golf Fitness Academy on the Golf Channel, Will discovered that there was a whole facet to fitness geared to golf. To incorporate golf training into his business, Will became certified by TPI. TPI is the world’s leading organization dedicated to the study of how the body functions in relation to the golf swing. Using the skill-set learnt from TPI Will used the program on his fitness clients. Results followed quickly contributing to increases in functional movement with the added benefit of lowering handicaps by 3-5 strokes! The program has also helped Will in his personal golfing endeavors. He was won multiple times on the Golf Channel AmTour. He also won his clubs member-guest invitational Match Play Tournament in 2016. In 2016 his handicap got as low as 2.8, improving by 3 strokes over 2015. Will now crafts his own training programs for competitive golfers, based upon the TPI screening procedure and supplementing the Functional Movement Screen (FMS). FMS techniques are very similar to the TPI fitness program, which in essence have the same goal of improving athletic performance by helping athletes to move better and eliminate physical limitations. By using the combination of both certifications Will sees excellent results in his clients. Hear firsthand what Will’s clients have to say. Staffordshire University, BSc in Sport and Exercise Sciences, 2000—graduated with Honors and Club Colors for Outstanding Contribution to Intramural Football League. Areas of study included Biomechanics, Coaching Science, Physiology, Psychology and Nutrition.